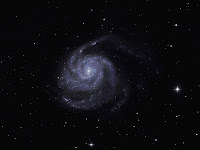 After several abandoned attempts at trying to a get a set of subs for M 101, on my return from the fortnightly MKAS meeting I was able to complete the job at last after a troublefree session. With the volcano induced lack of aircraft it was a delight to see such an unblemished sky from horizon to horizon. The transparency was fairly good with a slight reddening in the subs but whether this was evidence of volcanic emissions would only be guessing. Details: 10" f4.3 Newt. 15x 10 minute exposures @ iso800 with CLS in DSS, CS2, Photobrush & XAT. Great image Pete, glad to see you got your guiding issues resolved. That is a very good image Pete. You've captured quite a bit of detail in the galaxy arms and it's a good size galaxy to image. I didn't go out last night as a 2 hour setup after getting home at nearly 11pm dissuaded me. However, after another perfectly clear day without a cloud or contrail in the sky I decided to set up a bit earlier today. I chose M101 as well as I started trying to image it last Monday only to have the clouds roll in. I had hoped to not have to use the CLS filter, but without it the background is just too light to allow me to separate the detail. Begrudgingly I put the CLS filter back in and decided to have a go at 20 minute exposures to get as much detail as I can (the photons from M101 are finally ending their long journey on my camera chip as I type this). I'm not capturing the same level of detail as you, but it has been a useful evening. I've been tweaking the PHD settings to see if I can improve the guiding graph. I think I still have a little way to go but there is a definite improvement. I hope your next imaging session goes well and look forward to seeing what you choose to image.